Ketond is quickly becoming the consumer's choice for ketone supplementation. Ketond comes in 3 delicious flavors - Citrus Mango, Caramel Macchiato and Tiger's Blood and for a limited time, Blue Raspberry, Key Lime Pie and Strawberry Daiquiri. Ketond is also 100% transparent with all of the ingredients used and nothing is hidden in a "Proprietary Blend". Each serving contains 11.7g of goBHBTM. Besides our delicious flavors, what consumers love the most about Ket?nd is that they are paying over 60% less and getting almost 3X the amount of ketones when compared to other ketone supplements. Ket?nd is also 100% transparent with all of the ingredients used and nothing is hidden in a "Proprietary Blend". In recent years the Office of Naval Research (ONR), Department of Defense (DoD), private organizations and foundations have been researching the amazing effects of ketone supplementation on human health and performance. Ket?nd does what all the other keto supplements wishes they could. 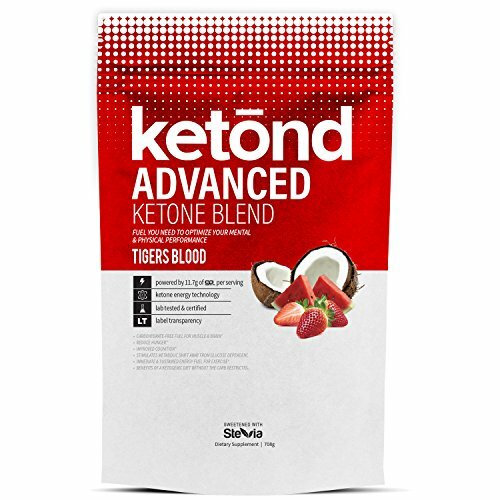 We deliver an Advanced Ketone Blend whose ingredients aren't hidden behind some "Proprietary Blend" effectively hiding the true dosage of BHB/Ketones. Our label is 100% Transparent. We list what is in our product and the exact amounts of what's in there. What you see is what you get. Ket?nd is Hands Down the Superior Ketone Supplement On the Market. More importantly Ket?nd is NOT part of some multi-level, direct pyramid style of marketing program. This means we are able to offer our product at a FRACTION of the cost of the other guys. Go ahead and research for yourself. Multilevel companies are great for the guys in the Pyramid but not so great if you are looking for a great supplement sold at a great price. The Ket?nd Revolution has begun. It's time to make this amazing supplement available at a realistic price. *Individual Results May Vary. Results will vary on individual circumstances. BURN MORE FAT - KetōndTM ADVANCED KETONE BLEND is the most powerful ketosis/BHB based supplement available. It's advanced and patented ketosis technology has been shown to assist weight loss, promote abdominal fat loss, and support better digestion. KetōndTM is ideal for men and women who want to improve and optimize their body's metabolism. Burn more fat and lose more weight with KetōndTM. IMPROVE ATHLETIC & COGNITIVE PERFORMANCE - Studies show that athletes who are keto-adapted oxidize fat at higher rate than those who use glucose as their primary fuel source. Studies have also shown that when there is an increased number of ketones in the blood stream athletes may maintain muscle mass easier, increase brain health, and increase athletic performance. Research shows that ketones promote healthy brain function, better clarity, ability to focus, reduce inflammation and brain fog. ALL-IN-ONE SUPPLEMENT - Stop spending $100's every month on supplements that don't work. Instead of taking a pre-workout drink, post workout drink, weight loss product, fat loss product, energy drink, and supplements for brain health, you can get everything you need with one single serving of KetōndTM. What you get with KetōndTM is the highest quality, patented blend of exogenous ketones available at an affordable price. PATENTED & POWERFUL - Each serving of Ketōnd is powered by 11.7 g of patented goBHBTM (beta-hydroxybutyrate) that will put you in the fat burning state of ketosis FAST! Increased blood ketone levels not only help you burn fat but they also improve athletic and mental performance and increase energy levels. 100% LABEL TRANSPARENCY - KetōndTM is the FIRST, 100% transparent ketone supplement available. What you see on the label is what you get. No "proprietary" blends. No misleading labels. BEST FLAVORS AVAILABLE - Let's be real. BHB drinks have historically tasted terrible! If you've tried ketone supplements you know what we're talking about. Ketōnd's R&D team spends countless hours crafting delicious BHB drinks that you will look forward to drinking. Right now KetōndTM is available is 6 amazing flavors! PURE KETO - KetōndTM is designed to be the purest ketone supplement available! No artificial flavors or sweeteners, no caffeine and no carbs! If you have any questions about this product by Ketond Nutrition, contact us by completing and submitting the form below. If you are looking for a specif part number, please include it with your message.